Whether you are in the US, Europe or India, not a matter for Facebook. It lets you connect each other, share thoughts, post images, upload videos and thus make you more closely with others in the different part of the world. But is it safe to share your contents with a stranger whom you never meet? We have tons of reasons to use social networks. But how to use is up to you. Facebook is the most popular social site and thanks to its efficient developers, who gave enough options to customize your profile in every way in order to avoid manipulation. Now we can make a close look at the privacy settings of Facebook. Do you want to post all your contents to the public? It’s not a good practice to inform them with each and every update including your traveling or home away details. Naturally, it will affect your safety. 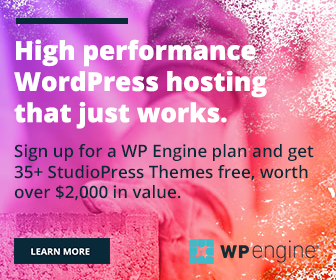 Make necessary changes to manage the visibility of your future posts. Go to Settings > Privacy > Who can see my stuff? To apply changes to previous posts, click on Limit Past Posts. You will also get the option to individually change the visibility of posts including status message, photo albums etc. To change the audience of a particular album, click on down arrow in the bottom right corner. Choose a circle for circle specific posts or Click on Custom to share your photos with specific friends only. The same setting is available for other types of postings too. If someone gets your email or phone number, they can access your profile using Facebook search. To prevent Public from searching for you, go to Settings > Privacy > Who can look me up > Change Everyone to Friends or Friends of Friends. But others can still check your Facebook details by simply googling. To restrict search engines from crawling your profile link- Choose No to Do you want search engines outside of Facebook to link to your profile. Restrict others from posting on your wall. It includes all types of posts like status messages, photos and videos. Go to Settings > Timeline and Tagging Settings > Who can add things to my timeline > Set it to Only Me. If someone tags you on their posts, review them before that appears on your timeline. Go to Settings > Timeline and Tagging > Review posts that friends tag you in before they appear on your Timeline? > Turn On. Want to know how others view your profile? Go to Settings > Timeline and Tagging > Review what other people see on your timeline > View As. You will be diverted to the profile page where you have to select a particular person in your friend list to know how he sees your profile. Manage visibility of your other timeline posts in second and third options. Some people keen to tag themselves in others’ posts. Discourage them by enabling review option, to manage such requests before it appears in their timeline. 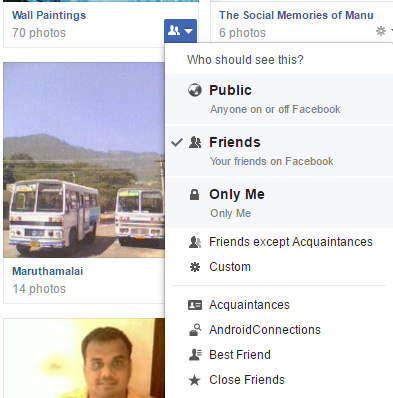 When people upload a photo, Facebook automatically suggests the names of their friends to tag on it. To restrict others from tagging you in their pictures, disable tag suggestions for you. All these options are available under Settings > Timeline and Tagging. If there’s someone who makes irritating comments on your posts, but you don’t want to remove him from the friend list or block, so add him to your restricted list. He won’t see any of the posts that you share with the friends but he can still view your public posts. Visit Settings > Blocking > Restricted List to manage the list. Block a person entirely from contacting you. Once you blocked, he won’t be able to see your posts, send messages and invitations. To block, go to Settings > Blocking > Block users. In case, if you want to block just his calls and messages not entirely, type his name in Block messages from list. But he can still post on your timeline (unless you disabled this option in setting no. 3) and comment on your posts. By default, anyone on Facebook can follow you and view, comment on your public posts. To prevent such following, go to Settings > Public Posts > Who Can Follow Me > Change it to Friends. This page also contains other options relating to your public posts like comments, notifications and profile info. We often login to various websites and apps using the Facebook account. Probably we visited them someday and forgot it later. This usually happens. But such connected apps are able to access your details even though you are not using it anymore. 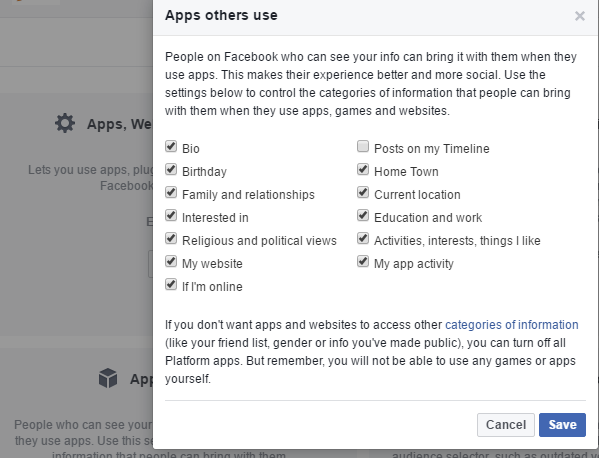 Remove unused websites or apps here: Settings > Apps > Logged in with Facebook. 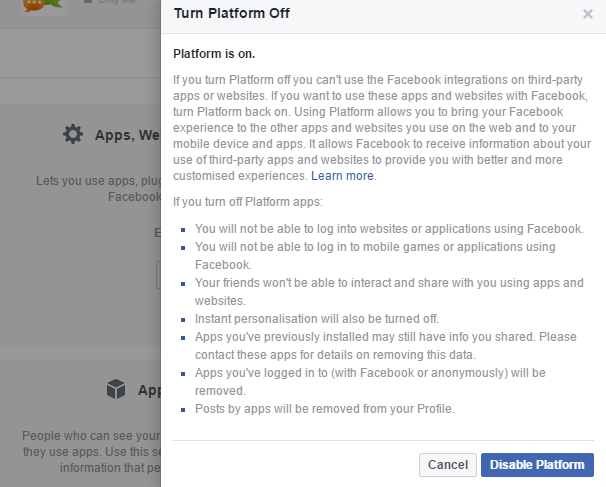 To enable or disable the entire login platform, go to Settings > Apps > Apps, websites and Plugins > Enable/Disable. Once you disabled, it will remove all connected apps from the list and won’t be able to use them as well without re-authenticating again. Instead of disabling the login platform, you can manage what type of information apps can collect from your account. Go to Settings > Apps > Apps others use > Edit. 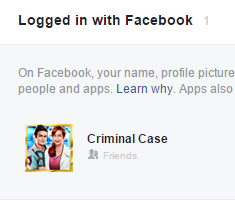 Depending upon the deselected categories, some apps may not work with Facebook in future. People can collect several pieces of your personal info from ‘About’ section of the profile. It includes your phone number, email and many other details. Go to Profile > About > Contact and Basic info and check whether your phone, email, address etc are available to Public or not. You can change its access to Friends, Specific friends or none. These are the best practices you can apply on Facebook to secure yourself from the prying eyes.